And here to see a chart of some of the grippers I use most often, and for what. These help children hold and manage their pencils with optimum efficiency, ease, and control. Different grippers work for different children. First, the thin foam sleeve or plastic triangle grippers commonly found for sale in drug stores and office supply stores don't do much besides providing a little cushioning for tight grasps. 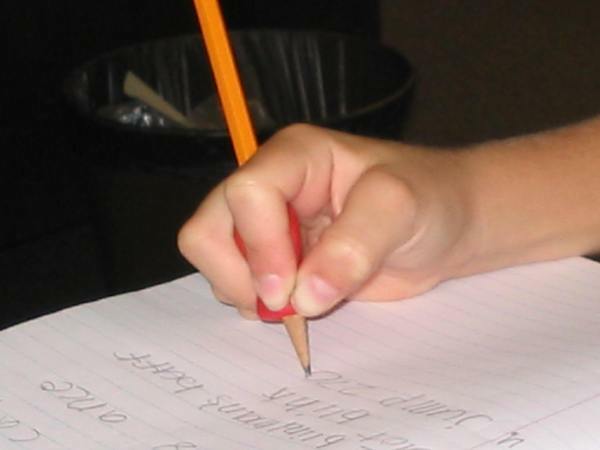 Effect of Pencil Grasp on the Speed and Legibility of Handwriting in Children. The most commonly recommended one in my experience is The Pencil Grip and the larger Pencil Grip Jumbo. It is big and squishy and is best for small hands (up to 7 or 8 years old). It rarely changes a poor grasp that has become a well-established habit, but it can make poor grasps more comfortable since it offers a larger and softer diameter than a naked pencil. The same company now makes even bigger ones too. My favorite one now is the Grotto Grip. Also, I sometimes teach children an alternative grasp. I use this when their thumb stability is so poor that they CAN'T hold and maneuver a pencil with their thumbtip on the pencil and an open webspace. This grasp is also helpful for people with arthritis, and just plain comfortable when you're hand gets tired after a lot of writing. I often use it myself! Start by holding up two fingers, like making a peace sign or V. Place the pencil between those two fingers, and the fingers should automatically fall into pretty close to a tripod grasp on the pencil. Try sliding the hand further up or down the pencil to get the best placement. The Twist n'Write Y-shaped pencil is designed to work with this grasp, and I find students are often willing to use them. Another often recommended gripper is the Stetro. It is small and semi-hard and has three indentations for the three fingers. It is more pushy about enforcing a "proper" tripod grasp than the soft & squishy ones, and so can sometimes change a poor grasp pattern, especially when use of it is monitored. I find that children who really have a hard time holding a pencil correctly hate this gripper and just push it up to the end of the pencil. A similar gripper but with a little larger surface, and more easily switched to left-handers, is the Solo grip. A gripper that forces into a tripod-like alignment at the fingertips -- most useful when someone is closely monitoring the child who is writing, such as during OT sessions, as it takes a few seconds to get it set up every time they take their fingers out -- is The Writing Claw (or, as a therapist I used to work with called it, the bra gripper - hee hee). Keep a separate eraser handy so they don't have to reset the grip every time they need to erase. And it tends to get kind of hot and sweaty inside those cups. You may want to poke an air hole into each one. 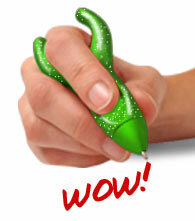 They come in different sizes for finger sizes, and the center hole stretches to fit fat writing implements. 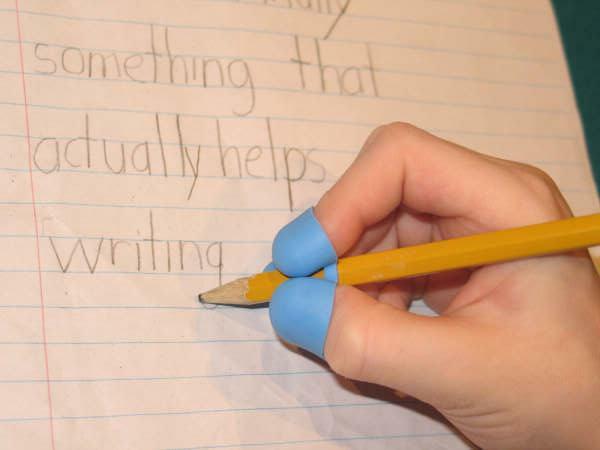 The StartRight, Grotto, or Crossover ( click link and scroll down) grippers are helpful for stubborn "thumb wrap" grasps (pencil wrapped over index finger). Each has a little "wall" that goes between thumbtip and other fingers. My favorite is the Grotto grip. can a HandiWriter. For directions to make your own imitation device to pull the pencil back into the webspace, click here. These would be the good-old-fashioned primary pencils as well as a raft of other fatter-than-regular #2 pencils from around the world. One that I use a lot is not only fatter, they are triangulated to encourage a tripod grasp. I know Handwriting Without Tears has some idea that fat pencils are bad, but this has never made sense to me. Anyway, making a sweeping statement like that about ALL children -- I think you just need to try things until you find what works for the specific student. For markers, just the fatter Crayola markers are good. For hands that can't maintain a tripod on those markers (many preschoolers), I recommend animal markers, crayons, stampers, paints and fat triangle crayons that are part of the My First Crayola line. I've sometimes seen them in toy stores with art sections and even at Target. Chalk, similar to markers, can be easily found in large cylinders as sidewalk chalk. In spring you can often find egg-shaped chalk around as well. The idea here is that an enlarged-diameter tool is easier to get the finger and thumbtips onto. That avoids developing a poor grasp and strengthens the intrinsic muscles of the hand in preparation for using smaller tools. Also, if the tool is short (I often break crayons or chalk into 1 inch pieces), the child can't spread their fingers out into some odd grasp; they pretty much have to use a mature tripod grasp! I also make heart-shaped crayons by melting crayons and pouring them in an ice-cube tray I found at Target. That shape has been working well for me! These are designed to sit on a child's desk and are useful for eliciting a better forearm, wrist, and therefore hand position with writing tools. This is because with your wrist slightly extended back, your thumb and fingers have no choice but to flex slightly into a good opposed-thumb position. Try it now: extend your wrist back about 30 degrees and see how your hand easily falls into a position to do careful work such as threading a needle. Now flex your wrist far forward and see how hard it is to make delicate movements with thumb and finger together. Slantboards are elevated at 20 to 30 degrees while desk easels have a much steeper angle (about 60 degrees). Some boards are adjustable in angle. They are also useful for presenting pages at a better angle than flat on the desk and so can help children with vision or visual-perceptual difficulties. As an alternative to buying a slantboard, you can use a 3" 3-ring binder turned sideways with a rubber band on it to keep papers from slipping off. NOTE: therapy putty will get into your carpet, upholstery, hair, and clothes and is difficult to remove (try icing it and then pressing a large piece onto the small stuck-in piece to pick it up). Therefore, it is recommended for younger kids only with supervision. For some therapy putty exercises that work on finger dexterity and hand development, click here. Adaptive Scissors, markers, crayons, etc. There are all sorts of adaptive scissors for children who don't have mature fine motor skills. For example, there are scissors with a little spring built in or with a loop on the handle which will open themselves. The child needs to squeeze the scissors to snip, but doesn't have to do the more demanding finger extension movement to open the scissors. An OT can recommend and may try out types of adaptive scissors for your child, but look at these little "learning scissors" for righties or lefties (also called Benbow scissors for the OT who designed them) if you are looking for something great for a preschool of Kindergarten child who is working on mastering scissor-cutting. Many of the catalogs below sell paper that has extra visual cues to help students with visual-perceptual issues such as visual discrimination. For example, Brightlines paper highlights the bottom 1/2 of each line (the part below the dotted middle divider line) to help clarify that space. Several types provide more space between each set of top-middle-bottom writing lines. 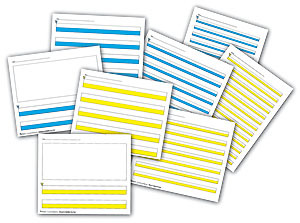 Handwriting Without Tears offers paper that is very simplified, with only a light-blue bottom and middle line and a large space for tall letters and hang-down letters to enter. You can design your own paper for children at this site if you know just want you want for a particular child, and do2learn.com has printable adaptive paper to try out for FREE (except paper and ink). The website do2learn.com has a wealth of resources, including worksheets to print out for the usual coloring, cutting, dot art, etc. A wonderful resource they have is printable writing paper similar to some of the styles sold in catalogs. You can find that following the links: activities - writing- writing paper, or click here. Pocket Full of Therapy - Fairly extensive catalog of fine motor tools. Therapro, Inc. - lots of activities, books, and tools. Prompt shipping, and it's free for orders over $25. Toys 'R Us - They put out a list of toys for differently-abled kids here, and "learning" toys here, though they no longer have a specific fine motor category. Therapy Fun Zone - a blog and online OT store from a pediatric OT in California. She sells my Pencil Obstacle Courses through her site. Your Therapy Source - online resource for special education, pediatric OT and PT. She also sells my Pencil Obstacle Courses (also see Packet 2) through her site! Handwriting Without Tears - good program for teaching children printing using multisensory approach; I use this but it's easy to do at home too! My favorite part is the "wet dry try" process with small chalkboards. (I prefer the Loops & Other Groups program for teaching cursive). Loops and Other Groups - program for teaching children cursive designed by Mary Benbow (uber-OT), using multi-sensory approach. It appears that you have to buy a whole packet of booklets, so it's not so cheap, but I believe you are allowed to do some photocopying once you've bought the program. Abilitations - wide selection of toys, fidgets, games, and tools, alongside sensory items and tools for physically disabled children. The paper catalog is easier to use than the online site, unfortunately. Southpaw - sensory integration equipment including clothing and other items for home, and gross motor toys. Sammons-Preston - big company (weighty catalog); medical-supply based with a pediatrics division. 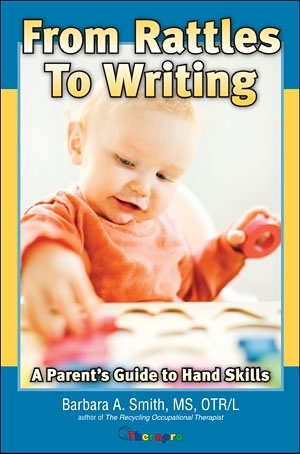 This book by occupationla therapist Barbara Smith is for parents to get an understanding about development of hand skills in their pre-Kindergarten children, and to engage children in activities to develop those skills. This is excellent to avoid developing the many wacky grasps that children come up with when trying to learn to write without having the developmental readiness to use a writing tool. Barbara also has a blog & website that includes activity ideas, The Recycling Therapist. Best Practice for OT in Schools from AOTA. Useful resource for sure! 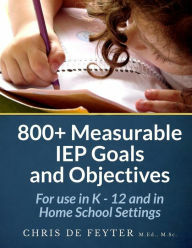 800+ Measurable IEP Goals and Objectives book. I've heard many OT's say this helped them. 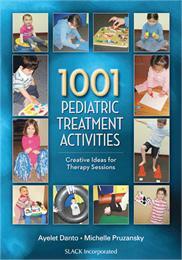 Slack publishers has published a book by two OT's called 1001 Pediatric Treatment Activities: Creative Ideas for Therapy Sessions. It includes some of the same activities I have on this webpage and others, and has helpful photos of many of them. I think it would probably be very useful for OT's getting started working with children.